The world runs on broadband. The federal government, state governments, and progressive municipalities are all clamoring to find ways to deliver this service to their constituencies. Statistically, broadband Internet access is becoming more and more important to the lives of people all over the world. As of August 2015, there were over 3,179,035,200 Internet users in 190 countries accessing the World Wide Web for a number of reasons including entertainment, communication, access to vital services, and education. The Internet’s increasing importance in our daily lives has led many to believe that Broadband Internet is a utility as vital to public infrastructure as public water, sewer, gas, and electric power. There is no cookie-cutter answer to what, if any, your municipality’s role in Broadband Internet delivery should be. No two municipalities are quite the same: socio-economics, geography, population density, commercial tax base, community vision, and economic development are but a few of the variables that contribute to every community’s uniqueness. As a government official faced with the need to keep pace with technology, it’s important to understand the technology itself. How will Broadband benefit you and the community you serve? 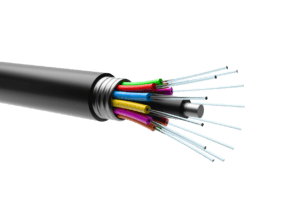 What are the financial and logistical aspects of delivering Broadband technology? This guide is designed to provide you with some general information about Broadband Internet, and some things you should carefully consider. This information, when integrated with all the factors that make your community unique, will provide you with the tools necessary to develop your community’s Broadband Internet options. Initially, broadband was a marketing buzzword, employed by cable TV companies to describe and encourage the use of an Internet service that was faster than dial-up. Today, in its most basic terms, Broadband Internet is a mechanism for transferring data at high capacity or bandwidth. One might compare bandwidth to a water pipe: a ½” pipe can deliver about 7 gallons/minute, while a two-inch pipe can deliver 55. With more bandwidth (bigger pipe), you can transmit more information at one time. The first is the minimum bandwidth at which data is transferred. The second illustration is the technology by which that data is carried – this being a product of cable companies quoining the term. Please note that most experts propose that the definition of broadband is based on bandwidth alone. While not all may embrace defining broadband based on its delivery method, it’s worth some discussion. 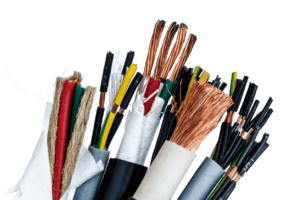 Until recently, copper wires have carried data, either over phone lines for dial-up or DSL or via cable. Because copper has resistance, the signal or data transmission is greatly reduced as the distance it travels increases. For that reason, bandwidth or capacity is limited. Today’s best technology employs fiber optics – thin strands of glass that transport data using light waves. Since there is little to no resistance to this technology, greater bandwidth can be achieved. To be clear, when we refer to Broadband Internet in this publication, we are referring to fiber optic technology. The Broadband definition as it relates to bandwidth has changed drastically over the past 20 years. In order to be called Broadband, there is a minimum bandwidth required regardless of the delivery method. When copper technology was the only option, the minimum was 1.5 Mbps. 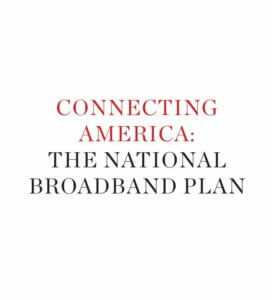 Advances in technology and changes in people’s needs have prompted both the State and Federal governments to periodically review and adjust their definition of broadband. So How Much Speed Do We Really Need? Below is an illustration of what a family’s internet usage might look like today. Early broadband technology gave us a platform on which to build. With that, came the development of applications to utilize that platform. As the benefits of these applications, email, streaming entertainment, and other cloud-based technologies became apparent, providers worked to develop better technology to deliver more services. And the cycle continues. Internet has become a household utility. 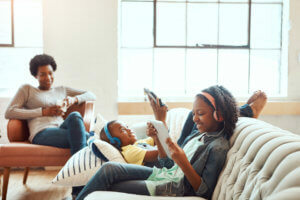 Home Entertainment and Connectivity: We have all become used to having the world at our fingertips. We may browse recipes, check the latest stock information, video chat, stream a movie or music, or play interactive online games. Telecommuting: Senator Angus King of Maine recently said “For the first time in history people can work where they live instead of living where they work” because of broadband Internet. Fast access to the Internet makes it possible for professionals in marketing, finance, design, customer care, programming, and a number of other computers based fields to telecommute, giving these individuals a chance to live where they want and eliminate commuting time. Distance Learning: Educational and enrichment opportunities for every age group are quickly becoming the norm at colleges, adult education programs, and even virtual elementary schools emerge. K-12 Education: Aside from the obvious access to information for the study, children AND their parents can always be engaged with the educational process through educational web portals that provide an interface to communicate with teachers and administrators, real-time access to assignments and grades, and numerous educational resources. Help your loved ones safely lead an independent lifestyle. Access to Health Care: Telemedicine has made advances that allow for the digital transfer of information that once required traditional telephone technology. Today, an Internet connection allows health care professionals to evaluate, diagnose, and treat patients in remote locations using telecommunications technology. Telemedicine allows patients in remote locations to access medical expertise quickly, efficiently, and without travel. Independent Living for the Aging or Disabled: Aging in place and independent living are quickly are becoming more important to us as the population ages. The most affordable home automation products are cloud-based and Internet-dependent. A wide array of products from voice-activated devices to monitoring systems to panic alarms can have a profound impact on quality of life for senior citizens, the disabled, AND the people who care for them. E-Government & Civic Participation: What makes government work as it should is transparency and public engagement. Today’s technology allows live streaming of municipal, state and federal proceedings – either in real time or more importantly on demand. Government websites and social media provide a continuous stream of information to the public as well as forums for public participation. Citizens can pay taxes online, register vehicles, procure hunting, fishing, and pet licenses, and with the click of a button, communicate via email with elected officials and staff. Many government entities have employed a messaging system that allows citizens to use any smart device to alert officials about everything from dangerous potholes to emergency situations they might witness. Energy and Environment: Transportation and power generation are 2 of the biggest impacts on global warming. Both Smart Grid technology for electricity generation and distribution and metering, and improved transportation management can develop efficiencies that will greatly reduce emissions and ultimately the carbon footprint. Hi-speed internet connectivity is integral in both cases. Libraries: Particularly during economic downturns, libraries become a haven for the public, providing computers and internet access, books and movies for inexpensive entertainment, and assistance with online job searching. Regardless of the economic climate, libraries are automated to the point that users can download digital media from home, reserve and renew books online, and access to myriad web-based enrichment and educational tools. The ability to telecommute is a big consideration for modern professionals looking to relocated. Economic Growth & Quality Jobs: There is much data indicating that hi-speed or broadband internet will improve the economic climate. Not surprisingly, according to some studies, the greatest positive economic impact is likely to be realized in rural underserved communities. This assertion is quite logical when one considers population density, income and education demographics, and the current economy in rural America. Rural America, simply put, has the most room for economic growth. Conversely, rural America faces some serious challenges to overcome before the economic benefits of the broadband internet can be realized. In review, it’s simple to see how many of these attributes of Broadband Internet access are mutually beneficial to individuals and society. Telecommuting, telemedicine, and distance learning can reduce our carbon footprint by reducing the number of cars on the road. Energy saving technologies like smart plugs in home automation systems can also reduce consumption and our carbon footprint. Home automation security and elder care products can help reduce the burden for public safety and emergency medical personnel. Access to distance learning at any level can have a profound effect on workforce development, and can ultimately enhance economic development. There is no question that Broadband Internet access is playing a larger role in our lives every day, and that its positive impacts continue to grow. Any entity, public, private, or municipal looking to establish Broadband Internet service to a community faces major challenges. Because the definition of broadband is constantly subject to change, based on trends in technology and data speed requirements, it is important to plan for this continued growth. Many towns are choosing to replace old copper with new fiber ones. Copper technology, based on today’s definition of broadband, is nearing obsolescence. 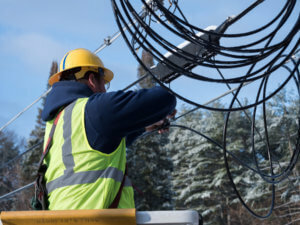 In response, providers are concentrating their financial resources to expand their existing fiber optics and when they fail, replacing copper lines with fiber technology. Geographic: In rural communities, delivery of Broadband Internet presents additional challenges. Low population density and more rugged terrain impact the cost of the infrastructure improvements that broadband requires. The cost per residence to build and install and the cost of service to the consumer are likely to be much higher than in a densely populated area. 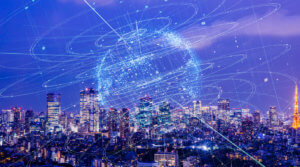 Operational: Some municipalities – those who already own and operate municipal power companies – can be well suited to owning and operating their own broadband network. These communities, in many cases, own utility poles, have field technicians to maintain the equipment and provide customer service and have staff in place to manage billing and collection and provide 24/7 customer support. Most towns, on the other hand, simply do not have the human or technical resources to make it work. Financial: While return on investment in the private sector may contribute to a company’s decision to build or expand broadband infrastructure, it’s safe to assume that all providers hold a long-term goal to convert to the best technology. 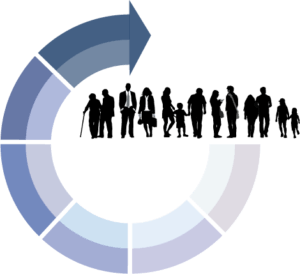 Most companies work to achieve this gradually through long-term capital project planning. In the case of municipalities and other publicly funded entities, other considerations hinge on an assessment of community vision and needs. Although you now have an overview of all that is Broadband Internet, a thorough community assessment is your next objective. What is the future vision? How would enhanced access to Broadband Internet help your vision become reality? Gathering the demographic information below, including 5 to 10 years of trending data, is the first step toward developing a snapshot of your community today, as well as an educated guess as to what your community will look like in 5 to 10 years. How does or will your population use broadband? With a clear picture of your community demographics, you can begin to make some projections. For example, if your assessment indicates that you have a village area that is about 10% of the square mileage of your town, it’s relatively densely populated (30% of total town population), and has a moderate amount of retail services. In order to preserve the rural feel of the majority of your town, you want to concentrate commercial development in your village and on its outskirts. Your median age is on the rise, your school population is decreasing, and an age-restricted community is planned at the edge of your village. With your new age-restricted living complex coming, and your median age on the rise, aging in place, telemedicine, and telecommuting would be among the more prominent Internet uses. Given your vision for the growth of your village, you’d concentrate on business retention and economic development. Ultimately, you’d want to increase the appeal of your village to shoppers, residents, and new businesses. With this information, you can fine-tune those broadband goals. Using this example, you would likely determine that Broadband Internet is most important to your village area. The new housing development will certainly be a prime location requiring broadband access, the existing area businesses may or may not need higher speeds, but maybe a deployment of free Wi-Fi in your village could bring more shoppers to the area, thus benefitting those existing businesses. The increase of shoppers and residents in your village, coupled with the broadband improvements is likely to draw new businesses, including some who may be more internet dependent, and would have otherwise not considered your once ‘broadband deprived’ village. Unless you happen to be one of those communities who operate an electric company, you probably shouldn’t consider designing, building, maintaining, and operating your own Internet company. Private partnerships are a great option for municipalities without the recourse to build and manage their own infrastructure. Recently, many broadband projects have used that terminology; meaning that the private entity provided the expertise and the public entity, such as a municipality, provided the majority of the funding. 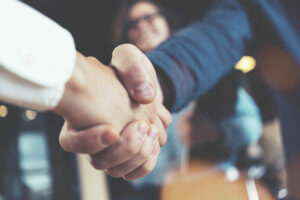 Essentially, such partnerships have come about based on the presumption that private companies are not willing or able to invest in rural broadband networks. That presumption may not always be accurate. First, make sure you’re not reinventing the wheel. Just as you’ve taken an inventory of your community’s demographics and determined what the needs are, you should now assess the existing broadband resources in your village. Who are the telecom and internet providers in your community? What, if any, service do they already provide in your target area? Do they have plans to add or improve service in your target area? Do they have plans to add or improve service elsewhere in your town? Is/are there local providers willing to work with you to meet the community’s needs? You meet with your local provider and learn that they have plans to build fiber on the outskirts of the village because they anticipate business growth; they have DSL at moderate speeds available in the village, and there are no immediate plans to build fiber in the village proper. Return on investment (ROI) is key to a private entity like your provider. If they are planning to invest on the outskirts of your village, it’s because they anticipate a positive return. With ROI in mind, can you make a case to your provider that it could be financially beneficial for them to redirect their investment to your village? Is the provider aware of the new housing project? Do they know about your projections and community vision for the village? What is the size of the area to be served? How many residents and businesses could be served? What percent of those businesses and residents would actually buy the service? With a clear understanding of your community and its demographic, you can answer these questions and may very well make a valid business case for your village broadband. In a looser sense, this could constitute a public-private partnership. Instead of providing municipal funds to build the network, you might, in return for the provider’s private investment, work to procure grant funding to help with the cost of the project and offer human resources to help publicize and market the project to ensure that people actually purchase the service. 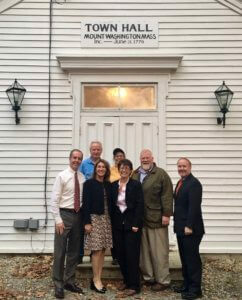 Community leaders in Mount Washington, MA recently turned up their community broadband network. What if you can’t make the case for private investment? With a clear understanding of your community and its demographic, you can answer these questions and may very well make a valid business case for your village broadband. In a looser sense, this could constitute a public-private partnership. Instead of providing municipal funds to build the network, you might, in return for the provider’s private investment, work to procure grant funding to help with the cost of the project and offer human resources to help publicize and market the project to ensure that people actually purchase the service. There are no hard and fast rules for how communities should get the job done, but you should refer back to the assessments you’ve already made. What network assets and product offerings are currently available in your community? What network assets and service offerings will be required to meet the broadband goals you have set for your community? Identify the gaps in network assets where an investment in infrastructure may be required. Should you consider the use of public funds to help the provider fill those gaps? What municipal resources are available? Would your voting public support such measures? The bottom line here is to keep the lines of communications open with the providers who already serve your community. Your community knowledge and vision coupled with their expertise is an excellent formula to begin your community broadband effort. 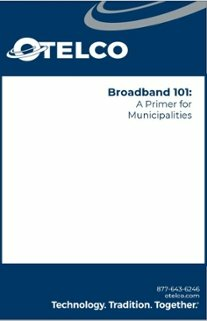 If you feel like you may want some more information on Municipal Broadband, talk to our expert today!